Postcodes (post codes or postal codes) are alphanumeric (containing both numbers and letters) and contain between five and eight characters (including a single space separating the outward and inward parts of the code). For example LA22 9BU (which is in Ambleside in The Lake District) or S33 7ZA (in Edale in The Hope Valley in the Derbyshire Peak District). Introduced between 1959 to 1974 by The Royal Mail, postcodes are designed to aid the automated sorting of the mail, letters and parcel. However, UK Postcodes have also been adopted for a wide range of other purposes such as designating destinations in route planning software, calculating insurance premiums and finding walks near holiday cottages, pubs, bed & breakfast establishments and hotel accommodation. An earlier system of postal districts was implemented in London and other large cities from 1857. In London this system was refined in 1917 to include numbered subdivisions, extending to the other cities in 1934. 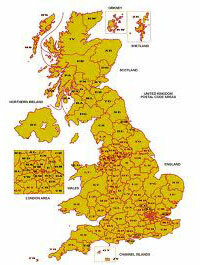 These earlier districts were later incorporated into the national postcode system. To find walks from a UK Postcode or walks near UK Postcodes - simply enter the Postcode into the Walk Search Box above (where it says 'Walk Search' just below our green navigational 'hills') and press 'Return' or Click 'Search'. The resulting page will display a link to a list of the 30 nearest walks to the geographical centre of that Post Code or Postcode. There is also a link to a Google Map centred on the geographic centre of the postcode along with the 30 nearest walks. NB. In the USA Postcodes are called ZIP Codes.